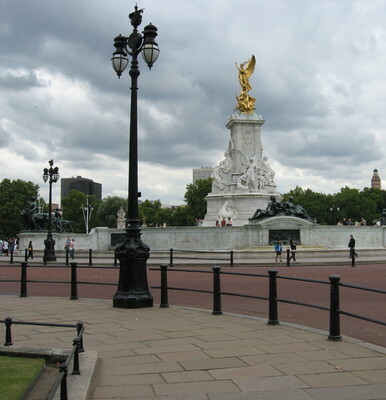 The Green Park is situated next to Buckingham Palace and is a short walk away from the larger St James's Park. The park contains a memorial to Canadian soldiers and is the site of the Queen's birthday salute in June. However, the large quiet lawns and ancient trees are the main attractions of this park and are a welcome sight for families out for a picnic or visitors looking to escape the crowds around the palace. The park is accessible by several bus or tube lines. Green Park station (Ritz Corner entrance) or Hyde Park Station (Memorial Gates entrance) are the closest underground stops to the park. Detailed information is available at the park's website or by consulting tube and bus maps. There are no parking facilities. From Buckingham Palace, the park is entered via the Canada Gate, which is a mere five minutes walk away. 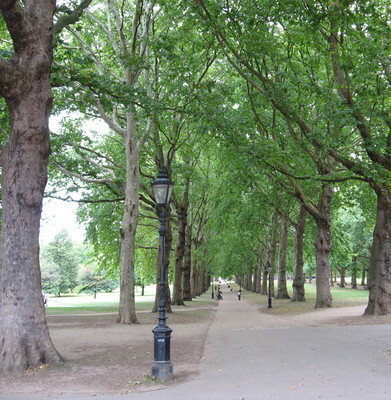 A single path lined by large Lime trees cuts through the park's grassland from the Canada Gate to Mayfair, while paths criss-cross the rest of the triangle-shaped area. The park lawns are a preferred place for picnics when the weather allows. Be aware that the maximum group size for a picnic at Green Park is restricted to 20 people. The park is a historic and preserved landmark and cyclists are recommended to keep to the provided paths. Also, sporting activities are not allowed on the lawns. The park is a favourite for walkers and a self-guided walking tour from Ritz Corner to the Memorial Gates will cover most of the park in under an hour. Ambitious walkers with several hours to spare may wish to plan a journey through St James's Park, The Green Park and Hyde Park, which are more or less connected, but vary significantly in design and character. As the smallest of London's parks, the variety of wildlife and natural features at Green Park are not as diverse as other parks, such as nearby St James's Park, which contains a lake and many species of waterfowl. 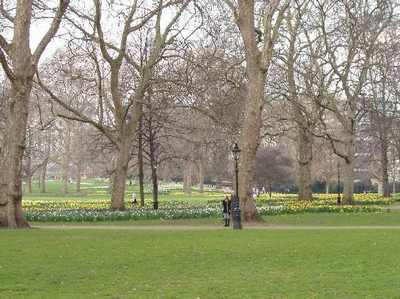 However, Green Park contains some of the oldest trees in the city and the lawns, particularly by the Canda Gate, are covered with thousands of daffodils in the spring. Two refreshment points are located at Ritz Corner and Canada Gate, which serve coffee, ice cream and sandwiches. They are open from 9am to 8pm in the summer and from 10am to 4pm in the winter. The park is open all year round from sunrise to sunset. Why? A peaceful park with old trees and plenty of open space for picnics.